Ah, that’s a better view. This shot of the former Als Auto downtown is not the view that impresses, it would be the view as you motor past the throat of Franklin Street while still on Water. I will insert another photo later. This area has the potential of being a brand new arm of the Downtown district. 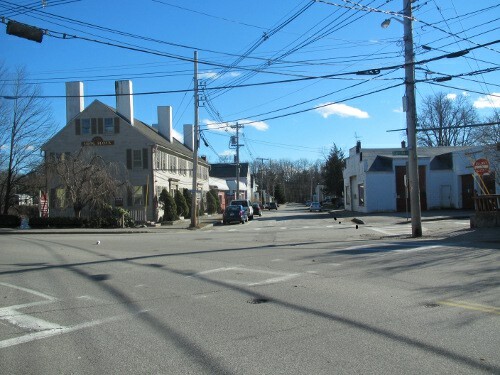 The TIFF proposed for the possible Exeter Mill expansion into the upper parking lot and open area on Chestnut Street could be the funding mechanism for this grand scheme. The new residents that fill that apartment building will be the customers for all the new shops and restaurants. There could be a river walk, hopefully alongside a dancing, flowing river. The Long Block would stay put, the rest of the area gets zoned commercial, and razed. One developer gets handed a clean site and we get a fantastic new area to enjoy and the Town gets revenue.Drive through the area slowly , check out the open parking area once occupied by the towing firm. I was down there one night picking up Doozie from a massage therapist in the Long Block. It was early evening and the drivers were horsing the huge tow trucks in and out of the garage, into the parking lots, back out again. This ballet went on for some time. I thought to myself that the neighbors must be overjoyed at their departure. If the Town does not move fast , there will be another auto related business, you could almost count on it. What a great opportunity, but such a tiny window. 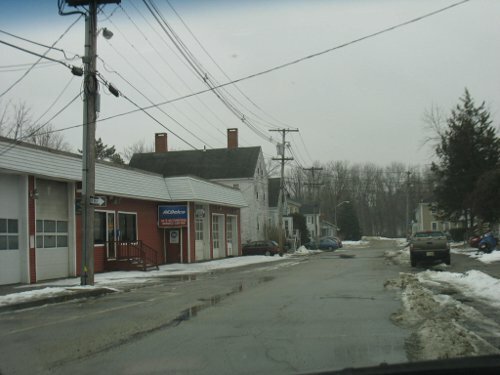 Here is link to a planning document for small towns while it was written in 2006, it still makes some very good points useful for consideration. As long as we are talking about doing great things for the Downtown let me share something else. The tax bill for this landmark, high visibility property gets sent to NJ. I think a note should be sent to the owner. 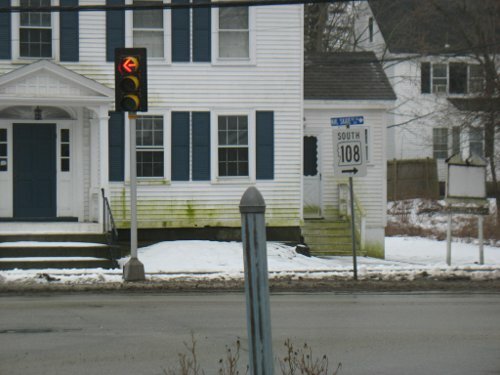 Could you hire a guy with a bucket and brush , some water and bleach, to clean up this eyesore? It would be nice. But I wonder whether there are any below-ground environmental conditions of the waterfront automotive operations that might be a hindrance to (or a cost to be borne by) future development. Hang on to your hat today Eric. When I drive through the Stratham “Gateway District” the overgrown lot between Shaws and Market Basket has always puzzled me.There is big red barn on the site. So a few weeks ago I called over there to inquire about why it is not developed. I could not get a straight answer so the next time I dropped some cardboard at Marty Wool’s(ex Stratham Selectman) recycling operation on Kingston Rd here in Exeter, I queried Marty on the property. It’s not developed because of concerns regarding a furniture refinishing business that operated on the site for many years. There might be a taint. If we run water up there should we ask Stratham to clean up that site first? Our water line would be going right past the possible plume of chemicals. Perhaps someone could call Mary Smyk a Stratham resident and ask her what Exeter should do regarding this possible issue. Why is the the exiting tenant/owner not responsible for site cleanup? When was the last time any property was bought/sold on that stretch? Or any construction? Probably been awhile. As I understand it, outside of a buyer making it a condition of sale, no one actually becomes responsible for any cleanup until someone — EPA, NH Dept. of Environmental Srvcs, maybe a local DPW — orders it cleaned up. Often, those agencies get involved only when something off-site happens–like suddenly there’s a plume of stuff leaking into the river, or the neighbors’ water (or the neighbors themselves) turns orange and smells. If construction on a water line were to begin, and toxins discovered, work would stop, the EPA/NHDES would presumably be called in, consultants hired, property records checked, etc. etc. (I think the last occupant was a small law firm, if memory serves.) Eventually, someone — consultants, EPA — would say if/how/under what conditions the water line could go through. 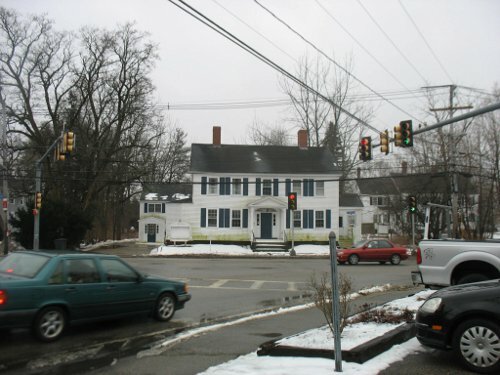 Maybe its analogous to what happened with the ancient burial ground found in Portsmouth a few years ago during road/utility work. First the profanities, then the phone calls. Stratham probably isn’t looking because they dont want to find out. You’re right, though . . .Ms. Smyk probably has some ideas.